Live Music and Live bands at the Cabana this week. 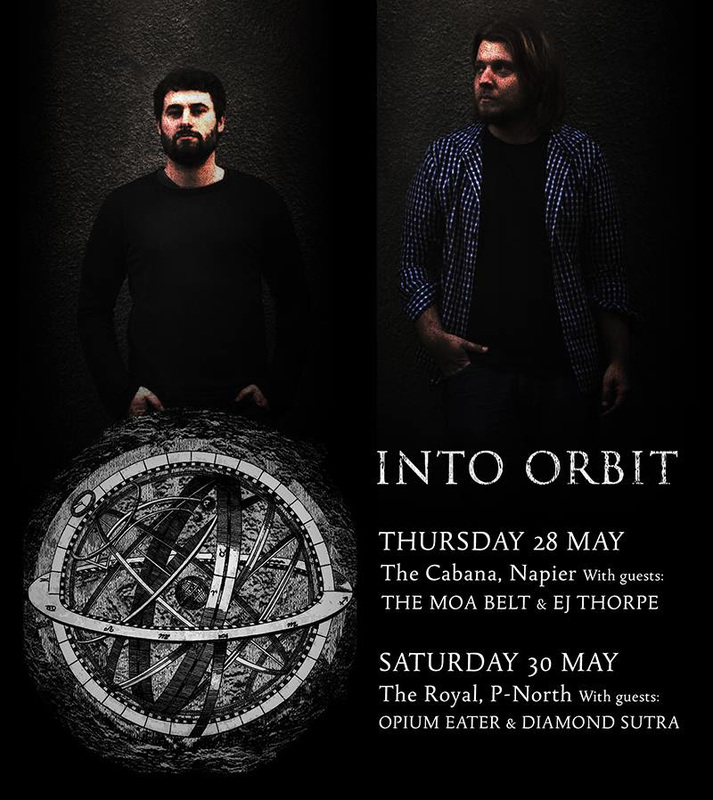 Wellington experimental rock duoINTO ORBIT are a dynamic duo of guitar and drums whose immersive, genre-defying sound contains aspects of post rock, prog, metal, ambience and drone. They independently released their debut album Caverns in August 2014, earning them high praise from critics and fans alike. THE MOA BELT …… are a FUSHION JAZZ project that has to be heard to believe…. featuring Mr Kurt Yates SUBLIME! EJ THORPE is a stunning artist who plays an amazing sound scape with a loop pedals with an other worldly presence. A standing ovation on her debut ! Beautiful. An Electric Heart is the solo project of Napier based musician/singer Luke Pell. 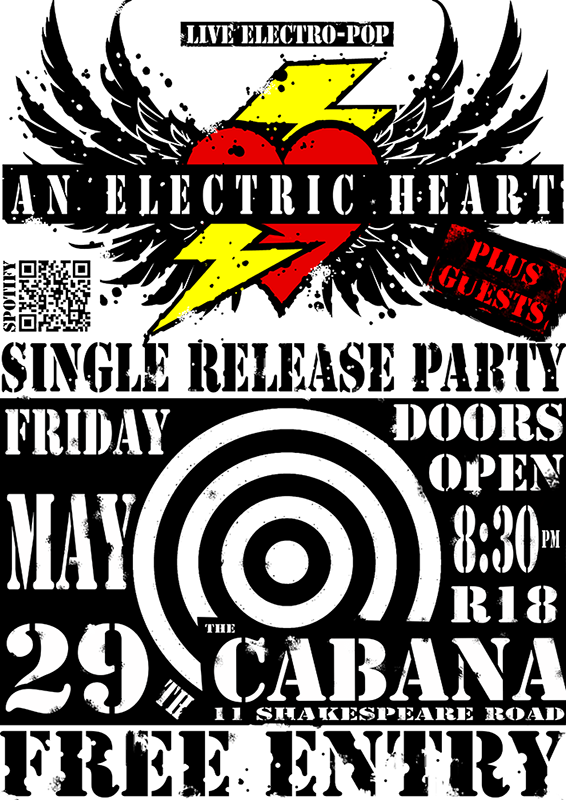 An Electric Heart’s sound is described as ‘alternative pop’ (think PET SHOP BOYS with edge). Pell is currently gearing up to release his second full length album (Due out mid-way through 2015) under the pseudonym An Electric Heart. ILLEVILHATER is serving up sounds like a mad killer on the loose serving up bodies. Step into the mind of a lunatic with lyrics exploring many horror themes. Streightup2014 May 27, 2015 . No Comments on Live Music Hawkes Bay. Categories: Uncategorized. Live Music and Bands Hawkes Bay this month (May) at the Cabana. Thur 7th … Ukulele Night … $10 free Drink. Fri 22nd … Confetti $10 with a free drink. Sun 31st 2pm … Americana Arvo … $5. Streightup2014 May 4, 2015 . No Comments on Live Music and Bands Hawkes Bay. Categories: Live Music. Streightup2014 April 22, 2015 . No Comments on Live Music Hawkes Bay. Categories: Uncategorized. Streightup2014 April 2, 2015 . No Comments on Live Bands Hawkes Bay. Categories: Uncategorized. 5 great Acts for $5 small dollars. Streightup2014 February 10, 2015 . No Comments on Live Music Cabana Napier. Categories: Live Music. Thursday 5th: Ukulele Night $10 1st Drink Free. Saturday 7th:The Rude Boyz ..Toki Sports Club Fundraiser $20 includes Food and Courtesy van. Streightup2014 February 2, 2015 . No Comments on Live Music Hawkes Bay – Cabana February. Categories: Live Music, What's On. Tags: Live Music, music hawkes bay. Streightup2014 January 7, 2015 . No Comments on Live Music Hawkes Bay. Categories: Live Music, What's On. Live Music – Datsuns at the Cabana Tonight! The Datsun’s are playing tonight at the Cabana Hotel, Napier, Hawkes Bay. I understand it’s $30 a ticket. Streightup2014 December 22, 2014 . No Comments on Live Music – Datsuns at the Cabana Tonight!. Categories: Live Music. Streightup2014 December 11, 2014 . No Comments on Live Music – What’s on at the Cabana. Categories: Live Music, What's On. Streightup2014 December 3, 2014 . No Comments on Napier Gospel Choir – Clive Square. Categories: What's On.